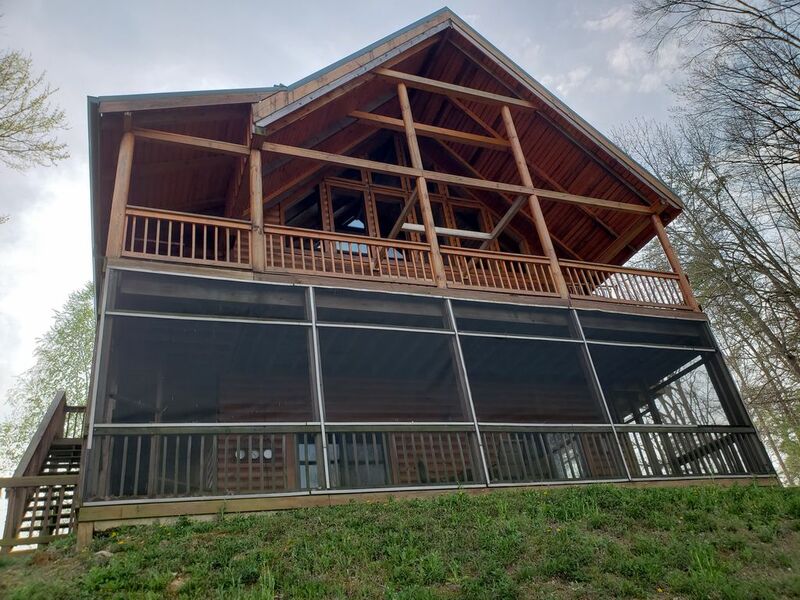 Stay in this beautiful log cabin in a gated community surrounded by Lake Cumberland and all of its beauty! This new spacious 4 bedroom, 3 bath retreat over looks Wolf Creek. Easily accessible to both Alligator II and Lee's Ford Marina. The first level has an open floor plan with a stone wood burning fireplace and fully stocked modern kitchen. There are two bedrooms and one bath on the main level also. The loft area offers a bedroom and bath and even more spectacular views. In the basement, there is another bedroom, bath, rec area and mini bar. Both the basement and main level open out unto decks. *On site three hole golf for practice before you head to the Links Golf Course. A Piece of Paradise it was!! We enjoyed our stay! The cabin was gorgeous, the space was more then enough for our large family & extended family that joined us from out of town! The view from the cabin is spectacular!! The online pictures do not show the beauty of this cabin enough, we were amazed upon arrival! We would love to stay again soon! I liked the wooden cabin and the location lake/river view sitting in the back porch. Nothing much to do around except boating (which I didn't attempt). Great place to get away from the hustle bustle of busy life and relax in the remote cabin. Only issue we had was dust on the floors and the fans. If the owner can ensure a clean cabin I have no problems visiting again. I have reviewed Vivek's comments with our cleaning crew. They will put additional focus on dusting. The current cleaners are doing an excellent job., but a little reminder is always worthwhile. Very nice place. Plan on renting again. Our cabin is great for family gatherings. So glad you had a good time. Our family enjoyed our weekend get away at this great cabin. Cabin has lots of room and 3 full baths which was very nice. Kitchen is well stocked with anything you will need. Mr Strautberg is absolutely wonderful to work with and very prompt on replying to questions you may have. Snow and ice were in the forecast for our original weekend we had booked and some of my guests were afraid they may not make it so I thought well it wouldn't hurt to ask Mr Strautberg if I could possibly move our stay up till the next weekend. I asked and without hesitation he said yes! He didn't have to do that but that shows you what a nice and accomadating person he is! We will absolutely rent again! Thanks again Mr Strautberg! The house is absolutely gorgeous and a beautiful, peaceful retreat! Our group of 5 friends had plenty of room and enjoyed a casual relaxing weekend. A bit disappointed we couldn't use the fireplace but otherwise it was PERFECT! We keeping this one on our list of "definitely go back"! Perfect for you large group of Kids and grandkids!